« EMC UIM/P upgrade from version 4.0 to 4.1 may fail. I am currently upgrading VMware vSphere infrastructure from 5.0 Update 2 to 5.5 U1. As part of the upgrade, I need to upgrade VMware Site Recovery Manager (SRM) 5.0.1 to 5.5.1 which is quite straight forward. Check out this and this articles. But what about EMC RecoverPoint? We are currently running RecoverPoint 3.5 SP2 (p74) and would like to upgrade to 4.0 SP2 P1 (m29). RecoverPoint SRA 2.0 supports VMware vCenter Site Recovery Manager Server 5.0 and later with RecoverPoint 3.4 SP1 and later. RecoverPoint SRA 2.1 is a 64-bit application that supports VMware vCenter Site Recovery Manager Server 5.1 and later with RecoverPoint 3.5 SP1 and later. Site Recovery Manager 4.X is not supported with RecoverPoint 4.0 and later. I have also been advised to upgrade RecoverPoint Appliances first and then upgrade SRA and SRM. BTW, RecoverPoint/SE is now customer upgradable!!! So, still tuned, RecoverPoint Upgrade blog post is on the way! 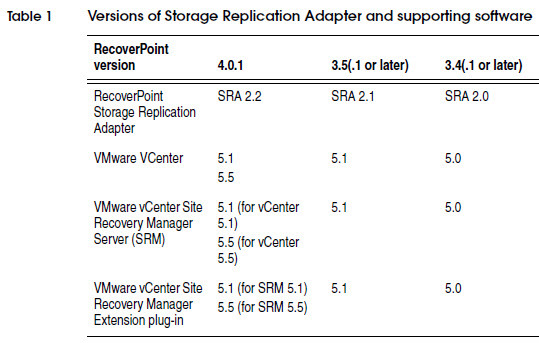 I have upgraded RecoverPoint from 3.5 SP1 to 4.0 SP2 P1 (m29) and can confirm that VMware SRM 5.0 U3 and SRA 2.0 are compatible. Everything is working as it should. We are upgrading from SRM 5.0.3 and SRA 2.0 to SRM 5.5.1 and SRA 2.2. We believe we are supposed to uninstall our 2.0 SRA before installing the 2.2 SRA. VMware tech support commented that this could negate the advantage of an in-place upgrade for SRM, in regards to the array manager config. Can you shed any light on this? Is vCenter 5.5 U2 compatible with RecoverPoint 4.0.x or 4.1.x? Interop Matrix on EMC’s site and on this blog just state 5.5 or 5.5 U1 – what about 5.5 U2?